Bankers Row, Burghers, is Fourth Avenue and I don’t even want to tell you how long it took me via Google searches, the Pittsburgh History and Landmarks Foundation website, and Google Street View to get my bearings and figure out where on Fourth I was standing and whether or not I was looking toward Grant Street or toward Stanwix. Now, I share this because DETAILS! Joseph L. Neal Architect had his offices here. This 1901 article from the Beaver County Times tells me Joseph Neal was working on the courthouse improvements. He also was architect of the Morrill Memorial Library in Massachusetts. 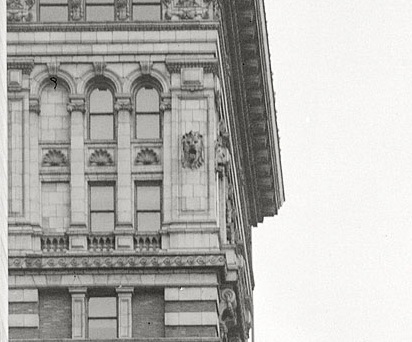 This building isn’t there anymore, but look at the gorgeousness of its detail. This is the former Merchants and Manufacturers National Bank building and I wish I knew more about it and that beautiful statue. Lots happening in this section of the photo. Why don’t we say “To Be Let” anymore? “For Rent” sounds so boring. Loving that big old clock, which predates the Kaufmann’s clock which wasn’t born until 1913. And I wonder what The Curb was? A whiskey and cigar joint for bankers to unwind in? Did people end sentences with prepositions in 1905? Although, this leads me to believe The Curb was nothing of the sort. And finally, look at that amazing gargoyle right under The Curb sign and then four more below it. Finally, it looks like there’s a barber pole right near the telegraph office. Now let’s move a little further up to the Arrott Building, a historic landmark which still stands and on which I’ve never noticed these amazing gargoyles or lions or whatever they are. This building is only three years old in this picture. Buildings. They don’t make ’em like they used to, guys. I’ll now be the girl walking downtown … looking up. Hope I don’t fall into a pothole the size of a Mini Cooper. Sorry this post was so focused on architecture, but after spending as long as I did researching this street and these buildings, NO WAY was I not sharing it all with you. Do you suppose the mayor reads these posts all, “History lesson time!” If he shows up at the mayoral debates with a new understanding of Pittsburgh history, I am taking total credit for that. Next history post will be next week and it will be those old PAT streetcars I promised you. Don’t know about “To Be Let” but there’s a good reason nobody would want a “To let” sign out front. See if anyone knows what that reason is. Took me a sec to figure that out. My husband and I had our wedding at The Engineers’ Society of Western Pennsylvania, which is in the old Union Trust Building on Fourth Avenue. We were both engineering grad students at CMU at the time, so it seemed the perfect place for us ;) It’s a historic landmark and was designed Daniel Burnham, the architect who designed Pittsburgh’s Union Station. Outside it doesn’t look like much, but inside it is really beautiful. The decor is a nice mix of the original architecture with “engineery” modern updates. They have preserved the old bank vault, which is now a private dining room. We used it to hold our gift table (you know, to keep them secure ;). We also placed our cake table in front of the vault door which looked really cool in the pictures. Ginny, if you haven’t been to an event at the Engineer’s Society you should check it out (they host a lot of engineering-related speaking events for local companies and universities). I’m sure you could just go and ask to look around and they would let you. Their staff is super nice. As a banquet facility it can’t hold very large groups, but if anyone out there is looking for a classy venue downtown for a small to medium sized wedding, I highly recommend it. The food and service were really great and the prices were very reasonable. The operations manager Michael Gaetano was incredibly helpful. Pittsburgh looks so much more European in these photos, I prefer that. The city seems to have more character. Plus, you have to wonder just how much skill went into crafting the columns, statues, and gargoyles. I really love these posts. I am such a history dork, and I love old buildings. LOVE reading these. Keep them coming! 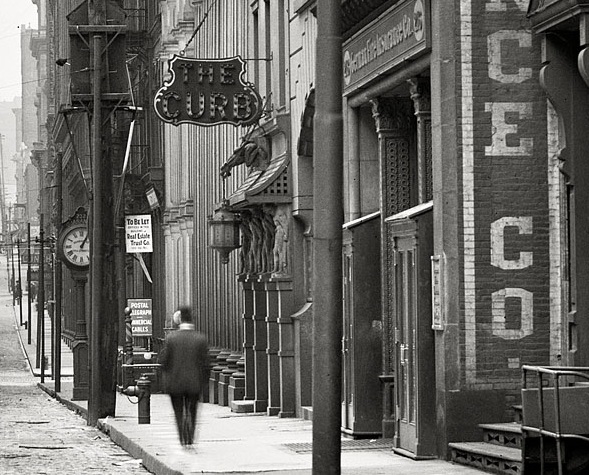 I love, love, love looking at old photographs of Pittsburgh…. especially then and now photos. The Post-Gazette has been doing a nice (weekly?) feature where the take an old photo and you can slide a bar and see where that is today. Thanks for sharing these gems! Oh man, this is like a history lesson-gasm. I’m loving all the old stuff Pittsburgh has to offer. I love the sleek new buildings, too, but gargoyles? Are you kidding me? Take note, future architects of Pittsburgh. Any chance you can find any stuff on Stanwix street? Those buildings look pretty original, facing the Mon. I’d love to know their story. Loving the history and old photo posts! Some time ago, I heard about a walking tour of the downtown area that focused on the architecture and details on the old buildings. I am now kicking myself for not going and never heard of another such tour being offered. Anyone know? It’s through the Pittsburgh History and Landmarks Foundation. The 4th graders of my kids’ school go on the trip every year. They get shirts calling them the “Downtown Dragons” – I’m heading for my second go round with them this May. It’s incredibly interesting and one thing that I’ve learned from them is that when I’m admiring the buildings downtown to always look up. There’s so much going on at the top of the buildings that I’ve never noticed before. 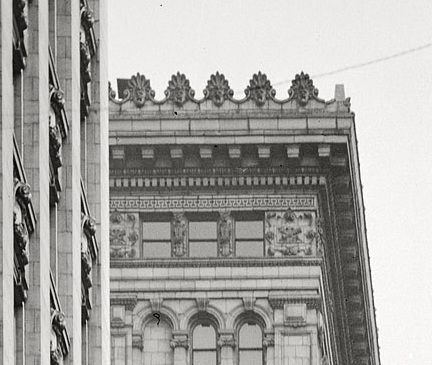 One building in particular – can’t remember which, but I believe it’s across from Macy’s – there are, instead of gargoyles, these stone faces of a man with a big mustache simply lined up along the middle of the building. A whole line of them – I have no idea who he is or what the significance is. Thank you, Cindy! I will have to look them up! Would love to check this out! Hmmm… Maybe Ginny could add this to her list of field trips for her loyal followers? 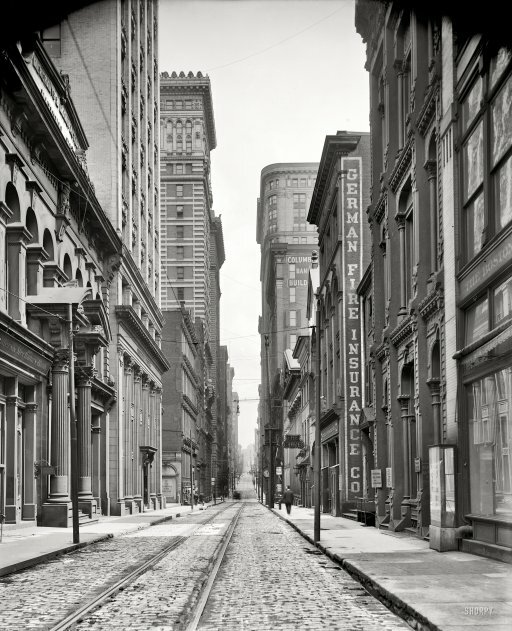 I am LOVING the Pittsburgh history 101 posts! Keep them coming!! I’m always checking out the website Shorpy.com since they often have old pics of Pittsburgh on there. Solving the puzzle of where a pic was taken is the best part. As for ‘The Curb’… I’m already trying to find out the story behind that place. See, a week ago I suggested you should be a history teacher, and now u iz 1. To be let…don’t know if they ended sentences with prepositions back then, but they knew how to use the infinitive. Architecture is awesome. And if anyone is seriously complaining about these or the old-Pittsburgh posts, screw ’em. I say MOAR! 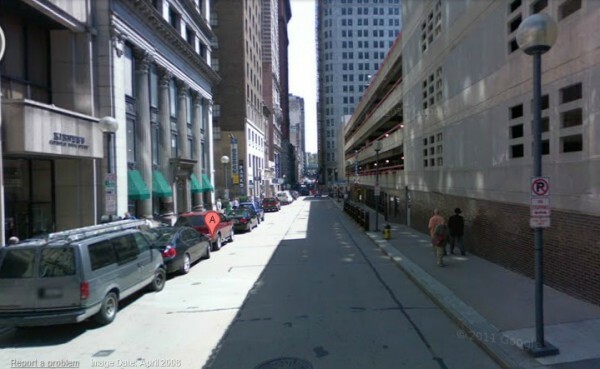 This is MY Pittsburgh before it became a shiny theme park with shopping bags for tourists. (TOURISTS???). Thank you for presenting these beautiful and unique remiinders. Gargoyles have always found a cordial place in Pittsburgh. Ginny, you should get yourself a copy of “Pittsburgh Then and Now.” It has a number of great old pics juxtaposed with the “current” view. Great stuff. My mom left the house next door to the one she was living in in Sharpsburg by stepping out of the 2nd floor window onto the porch roof and then into a rowboat. They had moved to the brick home as it was “safer.” For months after the water receded my grandparents literally hosed out the inside of their home. She said when you walked through it little puffs of dust from the mud would come up from the floorboards. I’ve been to both houses and at street level it is overwhelming to think that where I was standing was under 20 feet of water. 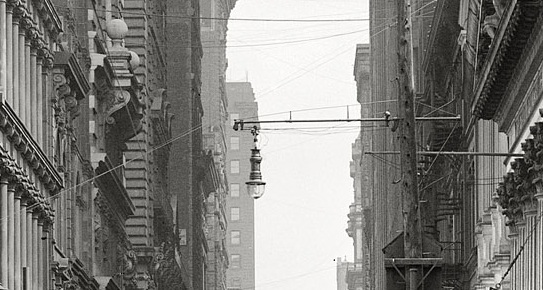 The always great Rick Sebak’s ‘Downtown Pittsburgh’ looks at the city’s architecture. Glad you are finally looking up… NEVER apologize for trying to relay ‘burgh history to we unwashed masses. Awesome post, Ginny, and thank you. I MUST get some gargoyles for my house. 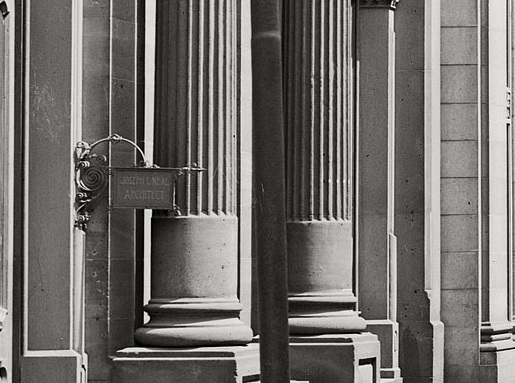 Your post on Banker’s Row is both a revelation and an affirmation for me because, just yesterday by coincidence, I was idly walking down Fourth Avenue and stopped. At the corner of Fourth & Smithfield. And took a few moments to gaze up, slack-jawed and rube-like, at the great Dollar Bank building (built 1875) — its facade, its columns, etc. — and wondered what it must have looked like when it was built, and what else might have been around. Just awesome. I shoulda been wearing a bowler hat. Keep up the great work. 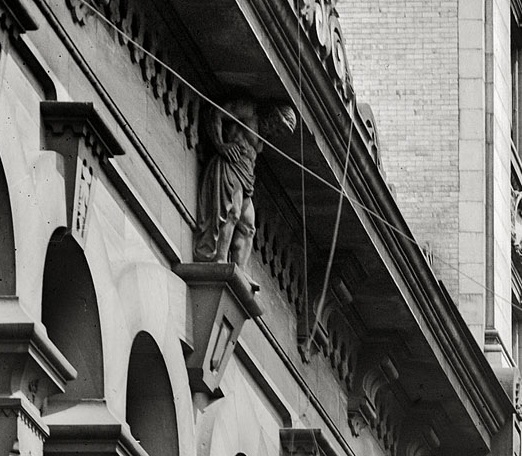 Trufax: A creepy thing on a building is only *technically* a gargoyle if it drains water. Otherwise, it is a grotesque. Not only am I an architectural historian, but I also stayed at a Holiday Inn Express last night (no I didn’t). All of PHLF’s tours are amazing. They used to do lunchtime tours every now and again–very much worth checking out if you work downtown, provided they still offer them.